At Cosgrove the weather was wet first thing on Saturday and seriously affected our sales. There was also very few people about. On Sunday it was dry but there were not the usual numbers of people attending so this affected our sales also. We took £69.40 with £45.80 for sales and £23.60 for donations. According to my records this is our worst year at this event since 2007. At Linslade we took a total of £254.70 with £196.50 for sales and £48.20 for donations. We also signed up one new member. All things considered though it was worth us putting in our efforts to attend these two events. Big thanks to everyone who comtributed in any way. At Braunston Historic Narrowboat Rally the weather was atrocious on Saturday and seriously affected our sales. On Sunday it was dry but there were not the usual crowds of people attending so this affected our sales also. As a result we did not do so well and in fact it was our worst year since 2008. We took a total of £389.35 – £337.70 from sales and £51.65 in donations. But we signed up one new member on Sunday. Overall it was well worth putting in the effort to attend these two events. We are, as ever, grateful to everybody who helped by crewing the boats, sales and showrounds, and to everyone who visited us. finally, we received the large cardboard cut out of a cheque from Braunston Marina for £2000 for supporting their Historic Narrowboat Rally. The official payment will follow later. Many thanks to these organisations for their vital support of The Friends of Raymond. We have continued to break yet another world record at Rickmansworth. This year we have taken £467.91 with £374.00 for sales and £93.91 for donations. The previous record was in 2012 when we took a total of £423.50 and this was followed with £423.08 in 2013. At Crick the weather was atrocious and as a result we did not do so well as last year. We took a total of £498.96 with £338.50 for sales and £160.46 for donations. Many thanks to all who contributed by crewing the events and by buying or donating. We are off and have attended our first event of 2014. The results are in and despite a very slow run of trade on the sales front we finally did not do too badly. Mind you, the Boat Share Show (formerly the BCBM Boat Show) is known not to be one of our big money-spinner events. There were only two show arounds on Saturday but there were a few more than that on Sunday. Our takings are as follows. Sales totalled £148.80 and donations amounted to £42.23 making a grand total of £191.03 for the weekend. We have recently attended our final events for this year. The income for these is as follows. Alvecote was a total of £226.33 with £212.70 for Sales and £13.63 for Donations. Although this is an increase of £1.63 over last years amount of £224.70 last year we only attended for 2 days whereas this year we were there for all 3 days so it is in fact a downward trend. Stoke Bruerne was a Total of £207.11 with £154.40 for Sales and £52.71 for Donations. FOR has gained some free publicity in the Waterways World magazine October 2013 edition which I saw in a shop today. There is an article in it about the Alvecote event. Both our boats are mentioned as attending this event and Nutfield is also mentioned along with Sickle for their help in towing Python, which was sinking, to safety in a nearby dry dock. Many thanks to all who helped, bought or donated. On 14th-15th September the little canal village of Stoke Bruerne steps back in time to the Second World War. Nutfield and Raymond will be there! In previous years there’s also been a flyover by WW2 aeroplanes – so remember to look up. And keep an eye out for Mr Churchill. Nutfield to the rescue at Alvecote! Last weekend, our delightful but slightly ailing boat, Python, together with Jan and Dave Warsop, the resident crew for the weekend, received tremendous help from Nutfield and members of Friends of Raymond. I am writing to thank you and your members who were at Alvecote when Python began taking on water for all the time and care you took to help Python, and for the tow to the dry dock at Grendon for remedial action. All of this not only took up your time and diesel, but also caused you to miss out on the winding competition. I know that Jan and Dave were extremely thankful to your members for their help, but on behalf of the entire Trust I’d like to thank Friends of Raymond for all the assistance, so freely given, to Python and her crew last weekend. Once again our sincere thanks and very best wishes to the members of Friends of Raymond who were about to help on the day. Raymond & Nutfield will be at the Alvecote Historic Boat Gathering this weekend. Those of you north of Braunston why not come along and see us! 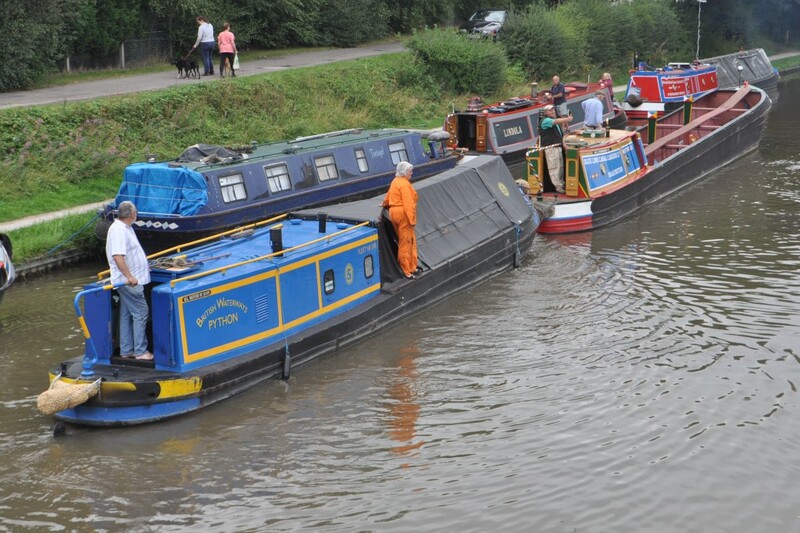 On behalf of the Town Council, I would like to say a really big thank you for supporting our eleventh canal festival and for helping us make it a truly successful event. Despite a rather doom and gloom weather forecast the day before, we still had an overwhelming number of visitors attend. We managed a head count during the day and reached 9,600 visitors, not an exact figure by any means but it gives us a figure which up until now we have only guessed. Once again we were delighted with the number of narrow boats that turned out as they always provide a colourful attraction. Whether they are working, historical or pleasure, all play an important role in the success of the event. We hope you had an enjoyable and successful day and hope you enjoy the rest of the summer.